Homeless children and youth in Illinois have the right under state and federal law to receive supports from their school districts to help them enroll, prevent school changes, and succeed in school. The federal government supplies some resources for school districts to achieve these goals, but the resources are far from adequate. 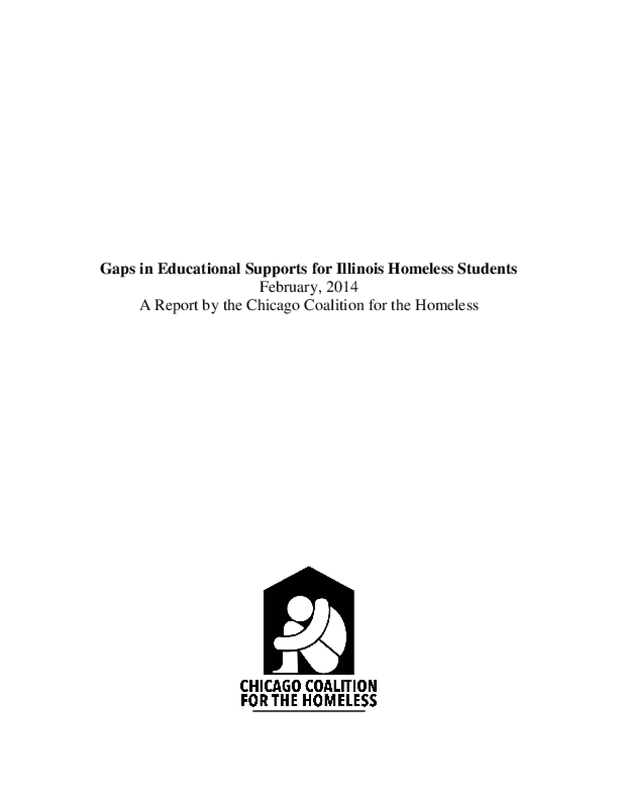 A December 2013 statewide survey found that in a majority of school districts, more than half of homeless students who needed support were not getting the following services: 52% said that more than half of homeless students did not receive tutoring52% said that more than half of homeless children that needed preschool did not access it.56% said that more than half of students did not receive counseling58% said that more than half of students did not receive help with public benefits50% said that more than half of students did not receive help with long-term housing44% said their capacity to identify and enroll homeless children and youth not in school was limited to very limited. The survey findings indicate a strong need for more resources. 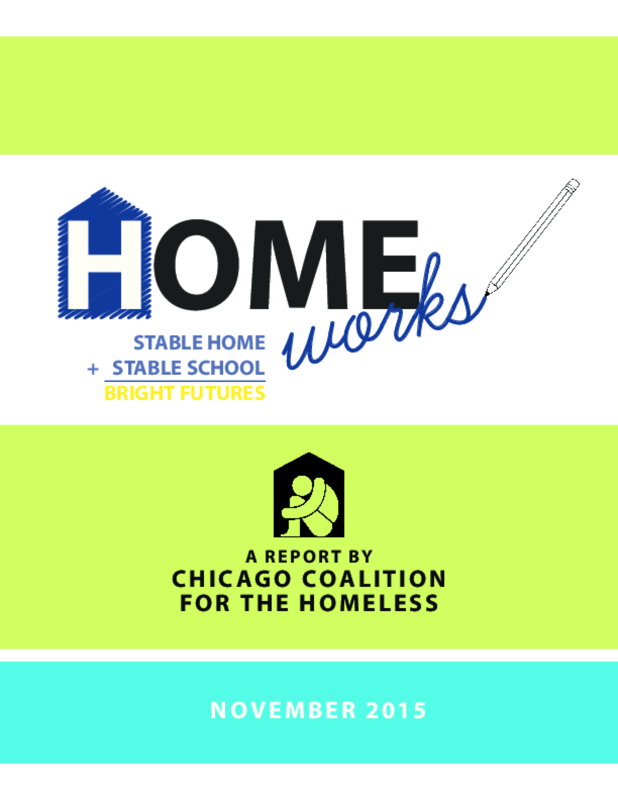 Chicago Coalition for the Homeless advocates that the state of Illinois restore $3 million in school grant funding to assist the growing and unmet needs of homeless students. 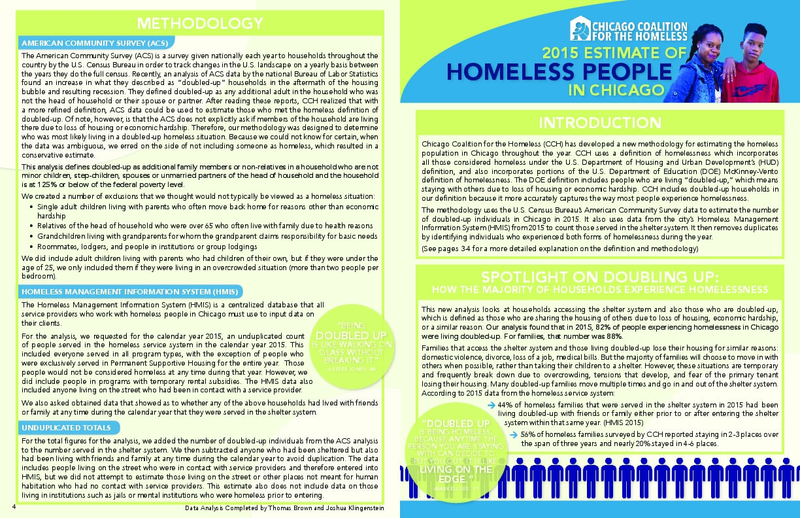 Chicago Coalition for the Homeless (CCH) has developed a new methodology for estimating the homelesspopulation in Chicago throughout the year. CCH uses a definition of homelessness which incorporatesall those considered homeless under the U.S. Department of Housing and Urban Development's (HUD)definition, and also incorporates portions of the U.S. Department of Education (DOE) McKinney-Ventodefinition of homelessness. The DOE definition includes people who are living "doubled-up," which meansstaying with others due to loss of housing or economic hardship. CCH includes doubled-up households inour definition because it more accurately captures the way most people experience homelessness. The methodology uses the U.S. Census Bureau's American Community Survey data to estimate the numberof doubled-up individuals in Chicago in 2015. It also uses data from the city's Homeless ManagementInformation System (HMIS) from 2015 to count those served in the shelter system. It then removes duplicatesby identifying individuals who experienced both forms of homelessness during the year. 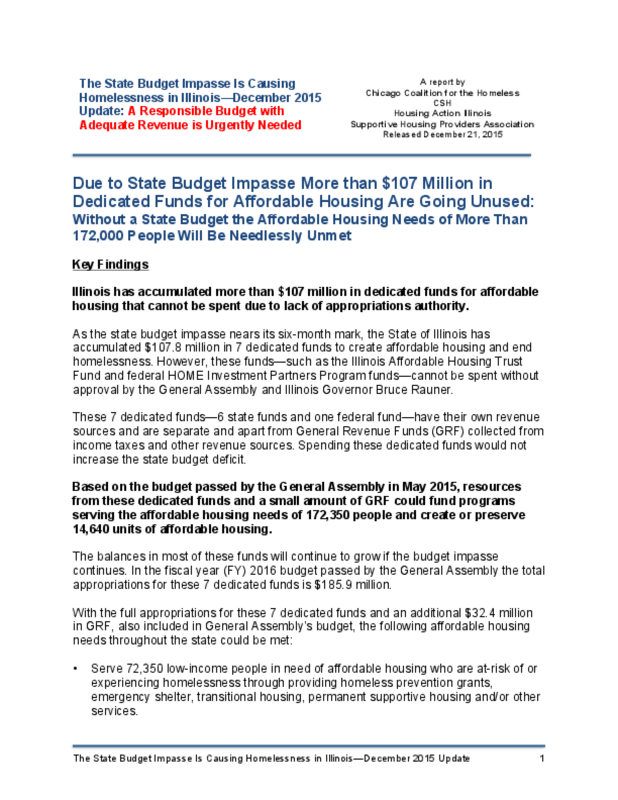 As the state budget impasse nears its six-month mark, the State of Illinois has accumulated $107.8 million in 7 dedicated funds to create affordable housing and end homelessness according to a report released today. However, these funds -- such as the Illinois Affordable Housing Trust Fund and federal HOME Investment Partners Program funds -- cannot be spent without approval by the General Assembly and Illinois Governor Bruce Rauner. These 7 dedicated funds -- 6 state funds and one federal fund -- have their own revenue sources and are separate and apart from General Revenue Funds (GRF) collected from income taxes and other revenue sources. Spending these dedicated funds would not increase the state budget deficit. Based on the budget passed by the General Assembly in May 2015, the report estimates that resources from these dedicated funds and a small amount of GRF could: Fund programs serving the affordable housing needs of 172,350 people. Provide funding for 14,640 units of affordable housing. The programs not being funded include homeless prevention grants, emergency shelters and foreclosure prevention counseling. The housing units are primarily permanent supportive housing for people who were formerly homeless. 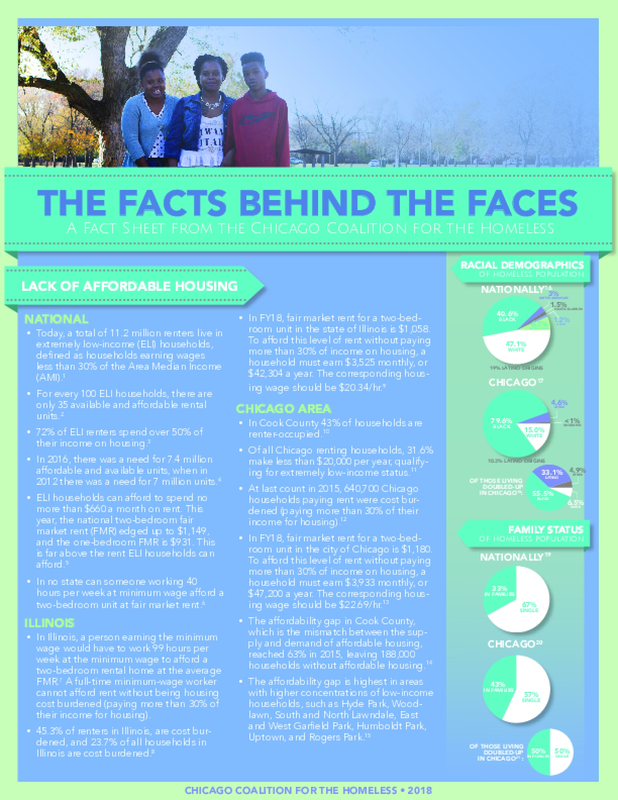 Chicago Coalition for the Homeless surveyed 118 homeless families with school-aged children and found that the experiences of Chicago's homeless students closely mirrored what the national research showed. 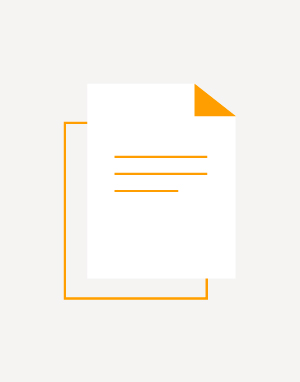 Surveys were conducted at public schools, shelters, and parks during the summer of 2015. More than 80% of the families interviewed have between 1 and 3 school-aged children and less than 20% have more than three children attending school. 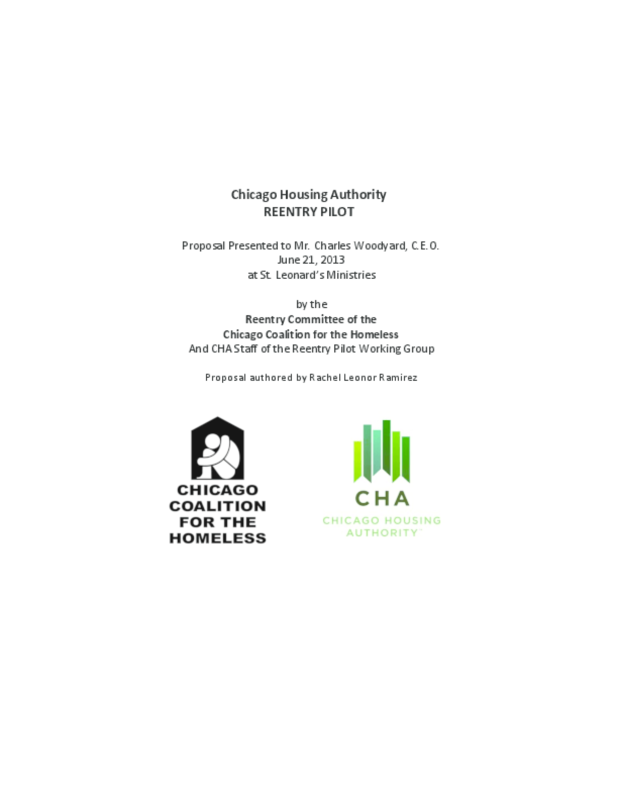 The CHA Reentry Pilot was designed by the Chicago Coalition for the Homeless (CCH) Reentry Committee and the Chicago Housing Authority (CHA). The CHA Reentry Pilot has the potential to improve CHA's responsiveness to community needs through an innovative approach to housing ex-offenders who have truly turned their lives around and who receive continued support from reentry service providers once housed. In February of 2009, staff of the Chicago Coalition for the Homeless began a dialogue with the Honorable Paul P. Biebel, Presiding Judge of Cook County Criminal Courts, regarding the possibility of a new problem-solving court specializing in prostitution offenses. For our own edification, we searched for other court models around the country with this same focus. We found several; however, there was no centralized source of information. There was also a lack of shared information among those responsible for coordinating these court projects. In fact, few of these court teams were aware of the other courts in operation. We found more and more court models randomly via keyword searches on the Internet or word of mouth. Those that we contacted regarding their court models were eager and enthusiastic about their models, willing to openly share any information requested, and excited about the prospect of new models and connecting with other existing courts and their associated programs. As we moved further into developing and preparing for the WINGS Project, the newly formed felony prostitution court in Cook County, Illinois, we felt that it would be highly beneficial to begin sharing the knowledge, best practices, and contact information among the courts throughout the country. We wanted to create a tool that facilitated communication and learning between all of the court teams. The information regarding these courts was invaluable in the creation of the WINGS Project, and we hope it can be as useful for other specialty courts for prostitution offenses around the country. The authors of this report have not physically observed any of the court or diversion projects described in this report other than the WINGS Project/Feathers and the Maywood court calls. The information presented about each project is based on countless hours of phone interviews and email communication, as well as any online articles or reports; therefore, the information presented is not completely neutral, and any subjective information or views expressed within those sections do not necessarily reflect the views of the authors. The court and diversion projects in this report are by no means meant to be an exhaustive list, but rather only what we have been able to find through extensive research to date. This report is, and may always be, a work in progress. Our hope is that this report will also help us gain awareness of other projects and even spur other communities to develop similar projects. The sharing of this tool should lead to even greater sharing, ever-improving models, and a much more comprehensive base of knowledge on the subject of effective criminal justice-based models that divert individuals with prostitution offenses away from prison and into desperately needed community-based services. 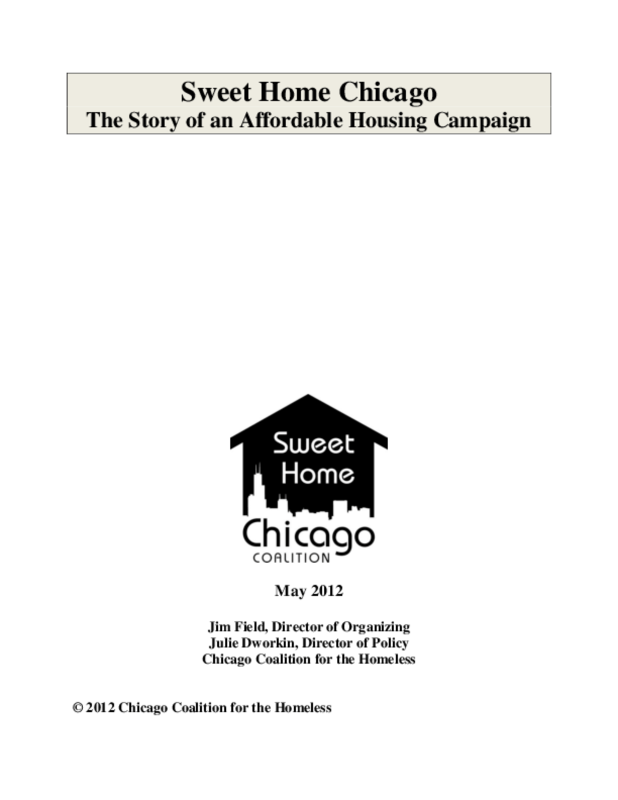 The Sweet Home Chicago (SHC) Coalition was comprised of nine community organizations and two labor unions that conducted a two and a half year campaign that resulted in passage of the Vacant Building TIF Purchase Rehab Program on May 4, 2011. This ordinance is one of the very few pieces of legislation to benefit low-income people that passed during Mayor Richard Daley's 22 years in office. More than 656,000 people experienced homelessness on a typical night in the United States in 2011. Nearly two-thirds of people suffering from homelessness are individuals and the other third are people in families (parents and their children). There was a 3 percent rise in homelessness na-tionwide between 2008 and 2009, with the number of people suffering from homelessness increasing in 31 states. Meanwhile, "doubled-up" households that move in with friends or relatives in order to reduce their housing cost burden, rose 12 percent over the course of 2009. Chicago Coalition for the Homeless estimates that 93,779 unduplicated individuals exper-ence homelessness over the course of a year. One of the primary data sources is the number of homeless children identified by the public schools. We believe this to be one of the most reliable data sources on numbers of homeless people. 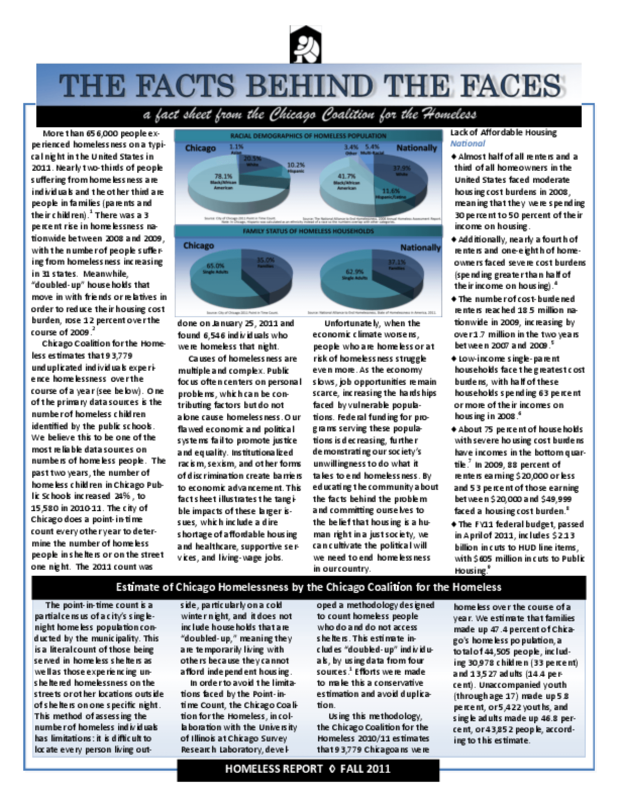 The past two years, the number of homeless children in Chicago Public Schools increased 24% , to 15,580 in 2010-11. The city of Chicago does a point-in-time count every other year to deter-mine the number of homeless people in shelters or on the street one night. The 2011 count was done on January 25, 2011 and found 6,546 individuals who were homeless that night. Includes national, state, and local data; information about youth homelessness, violence and homelessness, and incarceration homelessness; charts, graphs, and statistics. Deep cutbacks in state funding have jeopardized two high-need programs that help Illinois households that are at immediate risk of becoming homeless, or already homeless and trying to get re-housed. 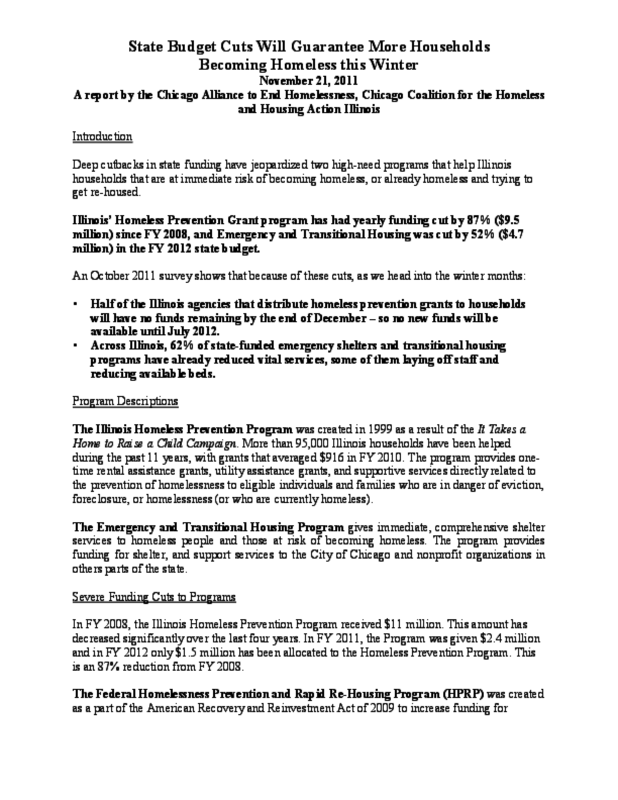 Illinois' Homeless Prevention Grant program has had yearly funding cut by 87% ($9.5 million) since FY 2008, and Emergency and Transitional Housing was cut by 52% ($4.7 million) in the FY 2012 state budget. 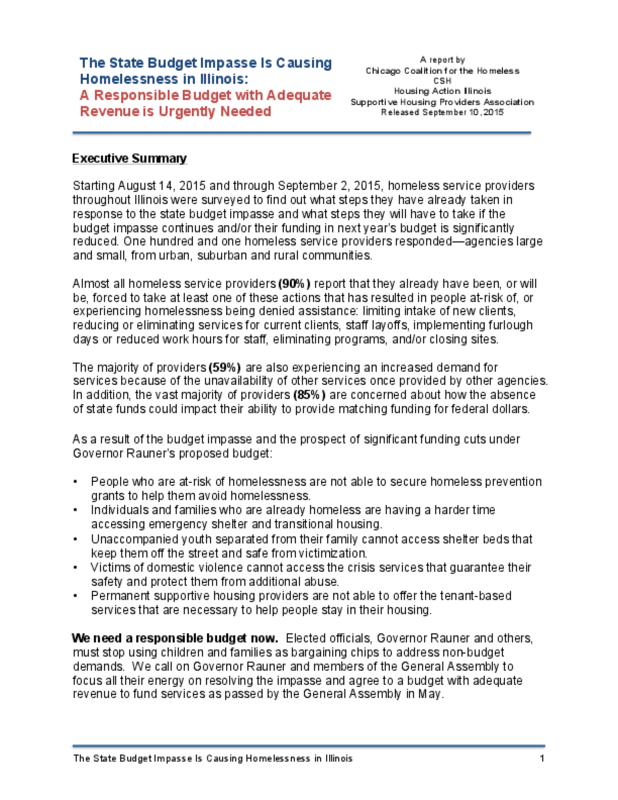 An October 2011 survey shows that because of these cuts, as we head into the winter months: Half of the Illinois agencies that distribute homeless prevention grants to households will have no funds remaining by the end of December -- so no new funds will be available until July 2012.Across Illinois, 62% of state-funded emergency shelters and transitional housing programs have already.